I have been following Cotton Stem on Instagram for a while and she has some really cute, but easily duplicatable, ideas on home decor. One of the things I immediately loved were her DIY topiaries! They were so cute, brightened up the space with the light green stems, and just seemed so whimsical. So, being the crafty person that I am, I immediately went to Hobby Lobby and proceeded to attempt my own topiaries. Here are her original directions for reference. Hey friends! I hope you all had a great weekend! 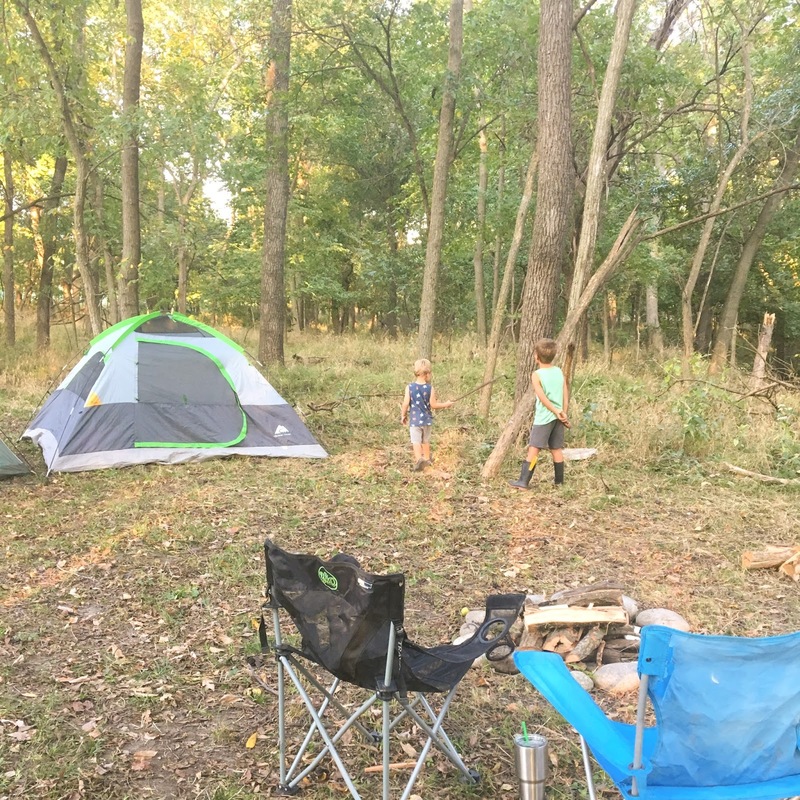 We went camping with the family this past weekend and it was a lot of fun. That’s one perk of living on a large chunk of land…you can decide to camp at a moments notice, when the weather is nice and you have supplies to make s’mores! I am admittedly not the most outdoorsy person. I do enjoy outdoor activities, but roughing it is not exactly my cup of tea. However, the boys LOVE camping, and I LOVE to be with them, so I wasn’t going to miss out on seeing them have a blast out there in the woods. And, because this experience wasn’t nearly as bad as I was anticipating, I wanted to share some of the things that made this camping trip fun! Loft Try On Sesh 40% off! Hey there! I talked about this yesterday on Instagram, but here are all of the pics from my Loft try on session. As much as I love to look at the models, sometimes I feel like it helps me to see clothes on real bodies. So, here ya go! There are so many cute things. If you have Loft Cash, the sales person told me that they have extended the expiration date to 9/24 AND they are allowing you to use the Loft Cash WITH the 40% off! You can get some amazing deals right now! For years people have been telling me that Chase would LOVE Minecraft. And for years I had no idea what in the heck Minecraft was. This past summer, we ended up getting a kindle prior to a long road trip, and I figured I might as well download this so-called amazing app for him. Well...that was the start of an extremely intense love affair between Chase and Minecraft! To say this boy is obsessed would be an understatement. 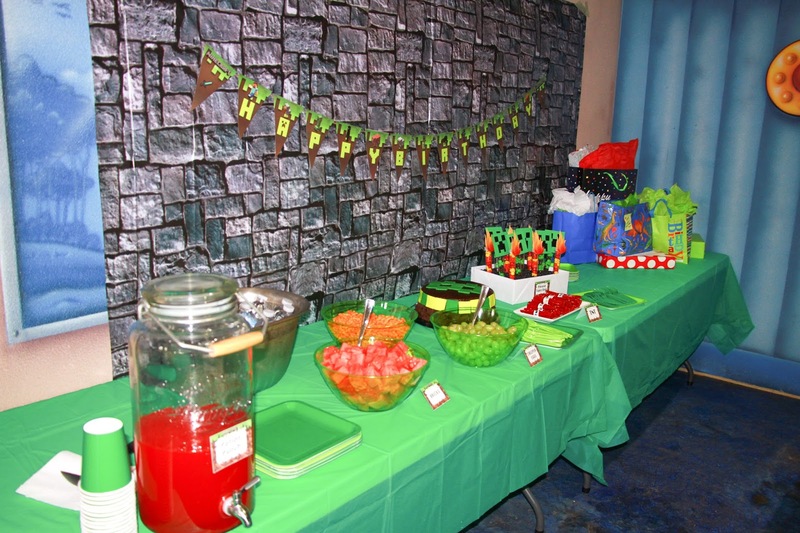 So, there was really no better theme for his party this year! Because it wasn't at my house, I didn't go crazy with Pinterest-worthy Minecraft party ideas, but I did try to make it special for Chase, and he was happy with how it turned out. And that's all that matters! This is US before the party! It's been tradition that I try to make a shirt for the birthday boy to correspond with the theme of the party. This year's shirt was probably the easiest yet! Chase is wearing his shirt in the picture above. Green shirt, black paint, done! Click HERE for instructions on how I make the custom shirts and to see shirts from years past. 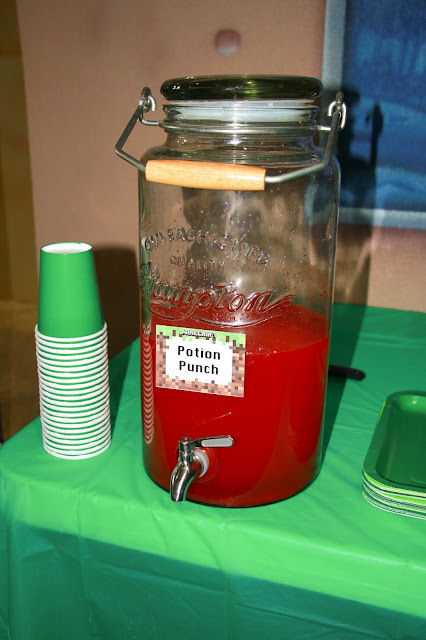 Our kids ask for this party punch at every single birthday. The color changes to correspond with the theme, but it's always a must at our parties! To get the recipe for the punch, click HERE. PS: I forgot to bring the sugar with me to the water park, and you know what? The punch was just as good without it! It was plenty sweet with the sprite and lemonade concentrate, so if you want to skip the sugar, go for it! Lord knows the kids get enough of it anyway! 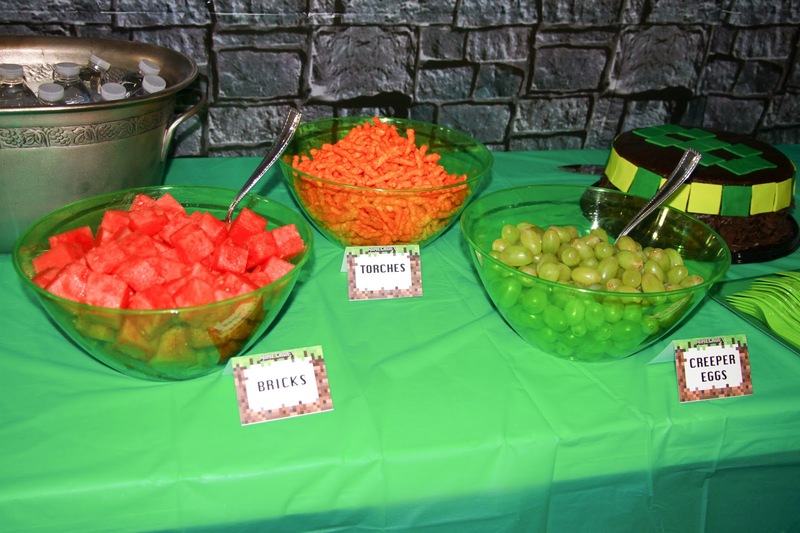 Party food! We served just a few little munchies for the kids. 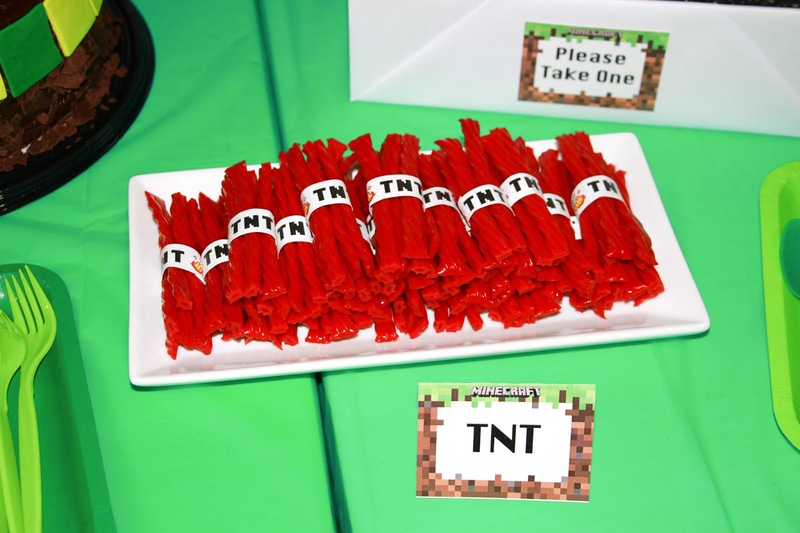 Twizzlers cut in half and then wrapped with TNT papers. I purchased this set of Minecraft place cards and tags, which I used for the food labels and thank you notes. 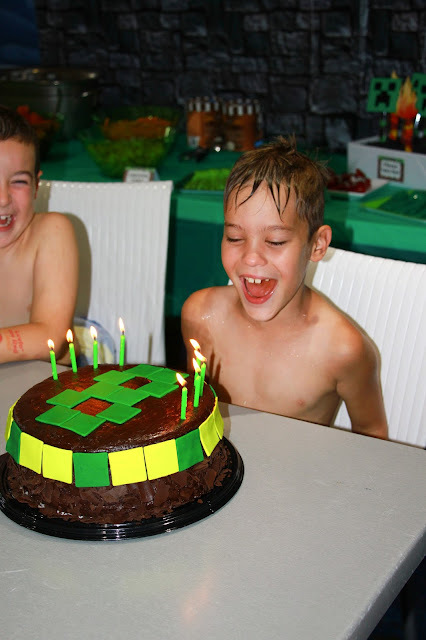 Chase requests the same round chocolate cake every year for his birthday. A Costco recently opened close to our house, and I had been hearing a lot of great things about their All American Chocolate Cake. I talked it over with Chase, and he decided he wanted to try it...so that meant I was off the hook! 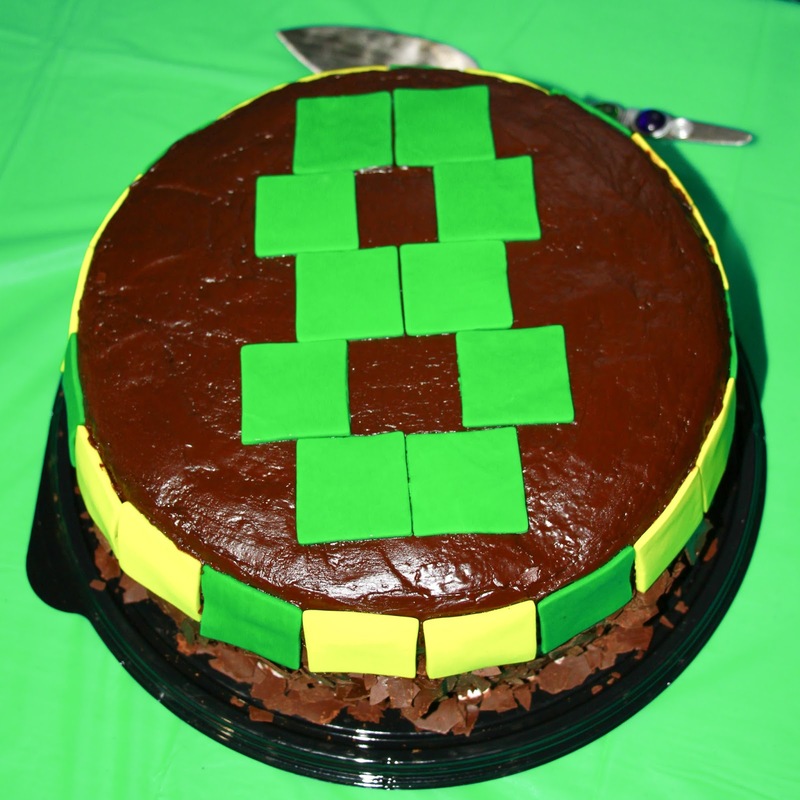 It came with some fancy icing on the top, which I smoothed out by using a butter knife dipped in warm water. I also had to pick some of the chocolate shavings off of the sides so the fondant squares would stick. But, considering I didn't have to make a cake from scratch, it was easy peasy! 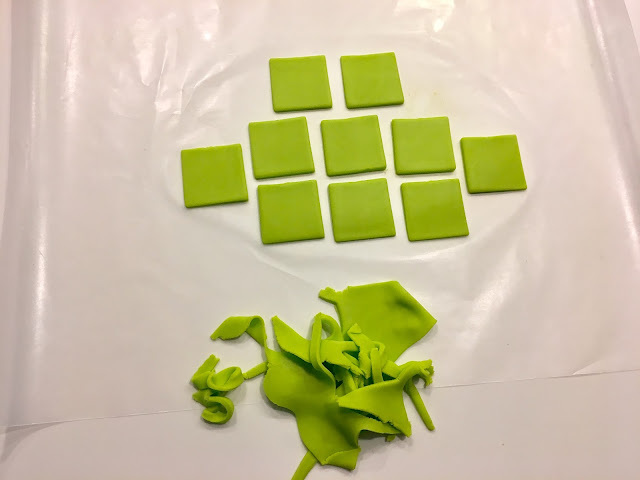 Ok, for the squares, I purchased two shades of green fondant from Hobby Lobby. 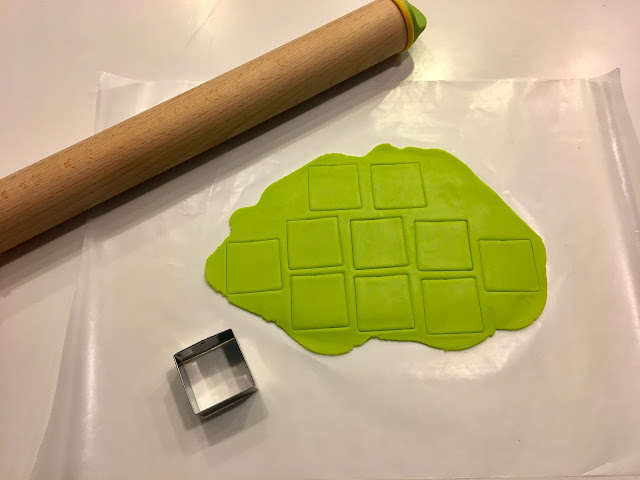 I rolled them out on a sheet of wax paper with a rolling pin and then used a cookie cutter (also purchased from Hobby Lobby) to make the squares. I wrapped them in wax paper, stored them in a baggie, and then refrigerated them until I was ready to apply them to the cake. 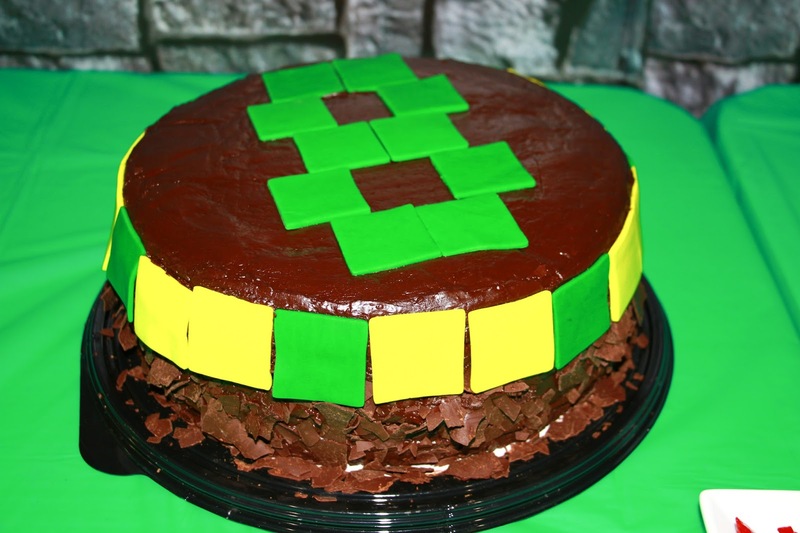 When it was time to put them on the cake, I used a butter knife with a small amount of warm water to barely moisten the chocolate frosting, then stuck the fondant squares on. 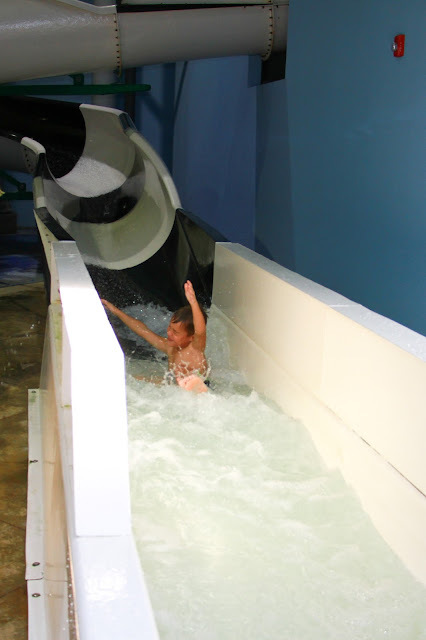 They stayed put overnight and also the entire time we were in the extremely humid indoor water park! Party favors: I ordered test tubes and filled them with coordinating colors of M&M's. 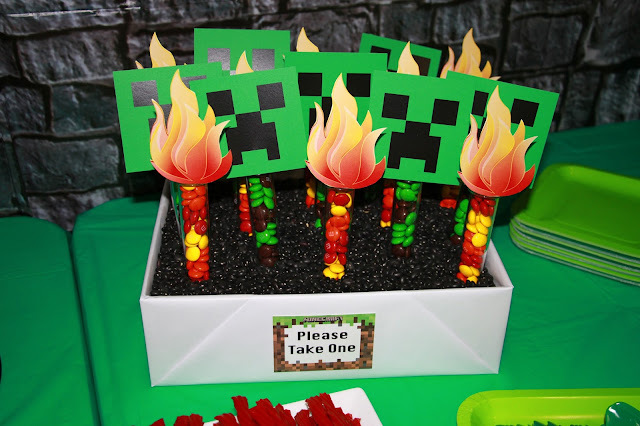 After finding some free clip art for creeper faces and flames, I had them printed and then taped them to the tubes. The white box is filled with floral foam and then covered with black beans. Sorting M&M's was a fun activity for the boys! The birthday boy having some fun! **Some of the links in this post are affiliate links. Clicking on them may result in a small commission to me. This does not affect the price you pay, but does help me maintain my blog, so thank you! Styling camo is actually pretty easy. It's surprisingly neutral and goes with more than you may originally think! 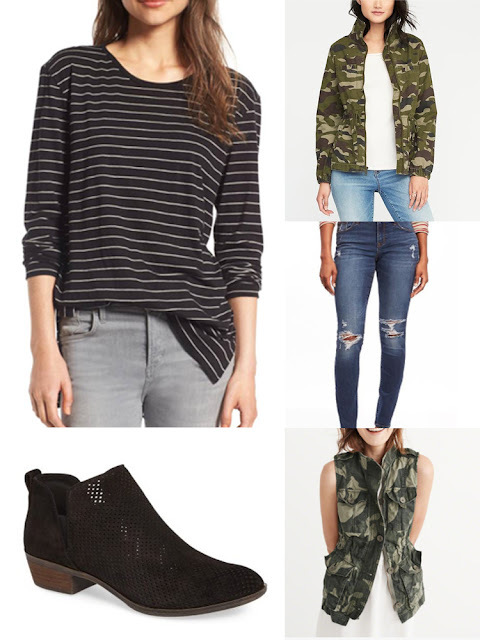 Stripes and camo are always a win! 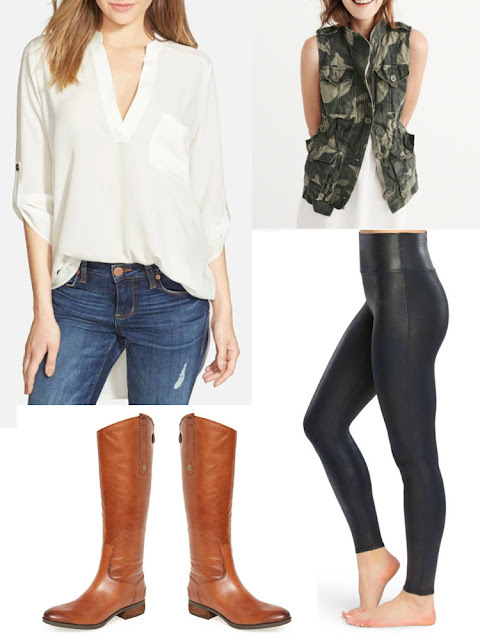 I love this longer tunic style tee with the camo vest or jacket over it. You could front tuck, or tie it in a knot. 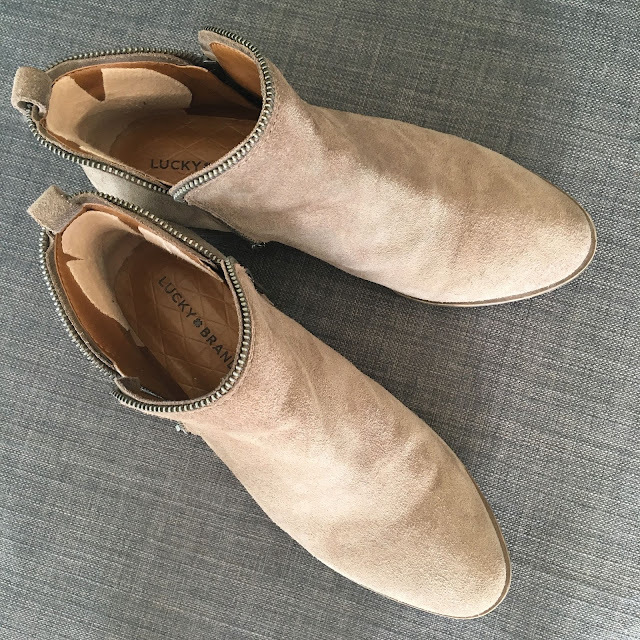 Style with some skinny jeans and booties, and you are all set! 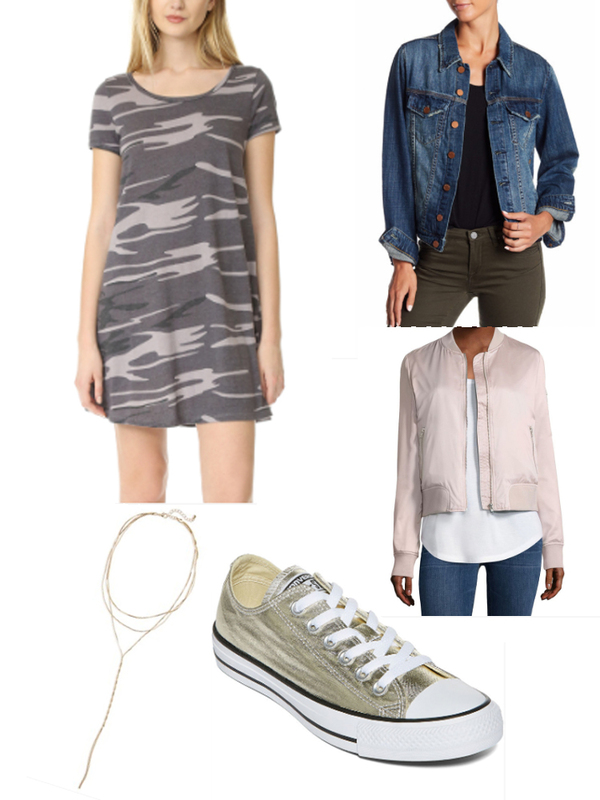 The camo jacket can be added to so many different outfits. I love it with this super cute ruffle hem dress! Casual but still super cute. These tunics are one of my favorite things in my closet. I have several colors and they are so versatile and would look great under a camo vest, leggings, and tall boots. Camo utility pants are cute with a solid color top (the above tunic would work again...see-so versatile!). 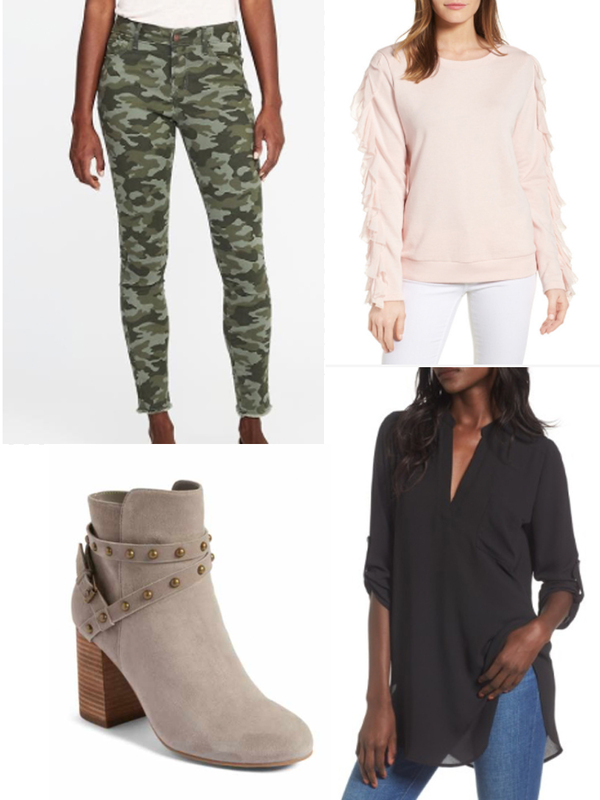 I love the idea of a more feminine top paired with the rugged look of the camouflage pants. Try a lace blouse, ruffles, or something with embroidery. 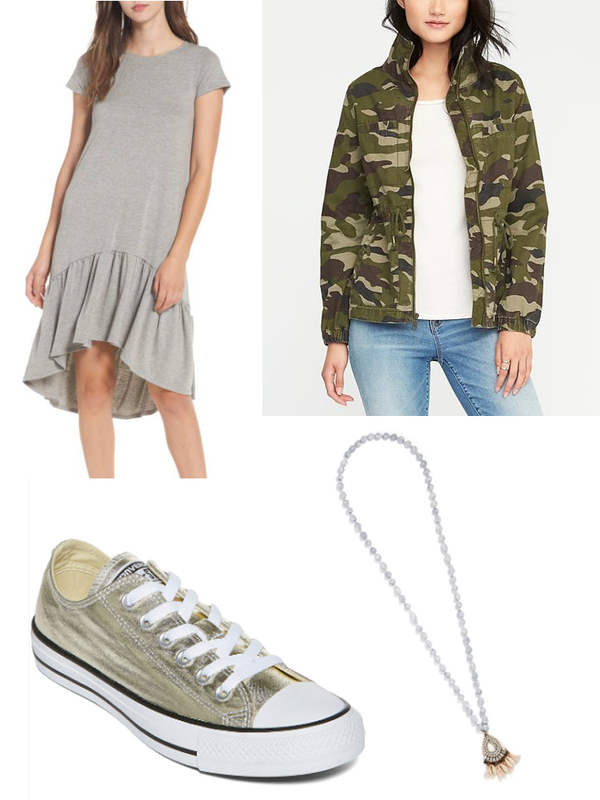 A camo dress is super comfy and simple to wear under a denim jacket, or a twill utility jacket. 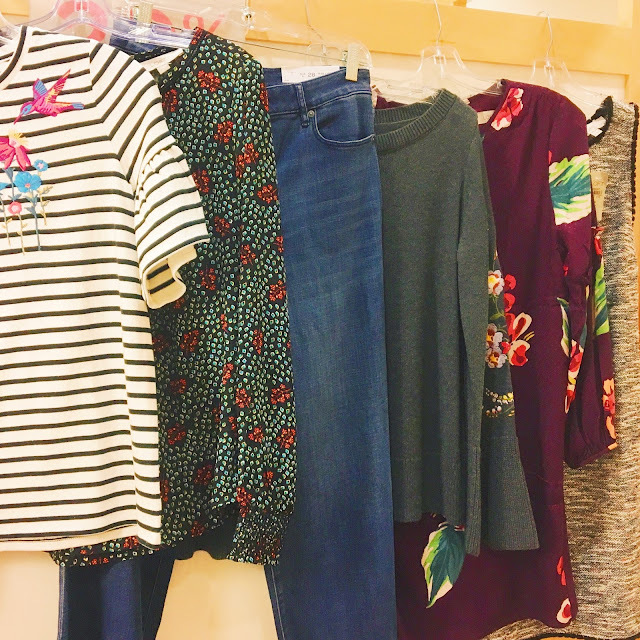 Even a cozy cardigan would be cute over the top! Add a fun necklace or a scarf and some booties or sneakers to complete the outfit. So, what's your opinion on camouflage? Yay or nay? I am loving it, although a little goes a long way. 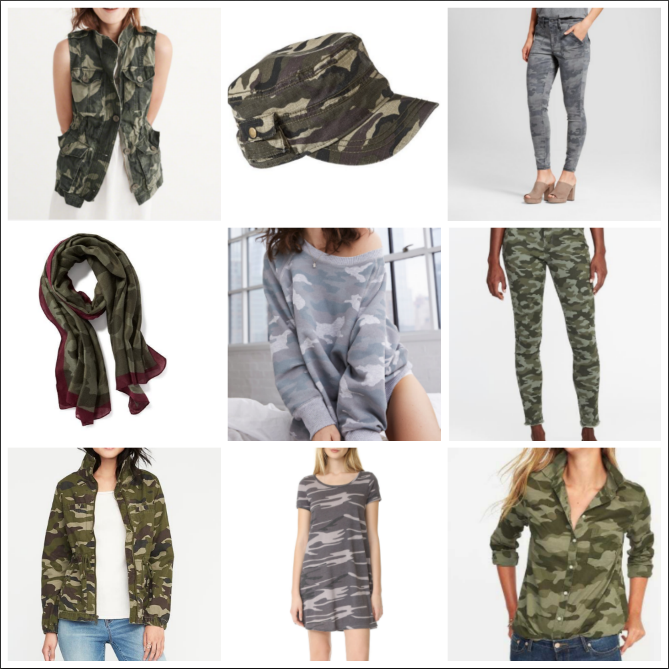 There's only so much camo a girl can wear, so choose your pieces wisely and then have fun experimenting with them to find your own personal style! **Some of the links in this post are affiliate links, which means I may make a small commission. This does not affect the price you pay but it does help me maintain my blog! So, thank you for your support! Moleskin. Do you use it? Do you even know what I'm talking about? No, I'm not talking about the actual animal. The moleskin I'm referring to is a fabric that is very sticky on one side and very soft on the other. It comes in a roll and you can cut it to whatever shape your little heart desires. I absolutely can't stand when a shoe rubs my foot the wrong way. Even if it rubs just the tiniest little bit, it drives me cuh-razy! I was first introduced to moleskin in college. I had never heard of the stuff, but my roomie used it (thanks Meg!) and a union between Niki and moleskin was born. I think this stuff is actually intended to be put directly on your blisters or calluses, but why wait for a blister to happen when you can prevent it in the first place! Sometimes I use a large piece and other times it's a tiny one...but I would bet that more than half of my shoes contain some sort of moleskin. I don't like to wear socks with my flats, so I put moleskin in the heels to avoid blisters. And, the same goes for some of my booties. In the spring and fall, I don't necessarily need or want socks, but if my feet sweat a little bit, then my shoes rub. But, not with the moleskin! I don't think I have ever gotten a blister from a pair of shoes that has been doctored up with this miracle stuff! So, here's how I do it. Depending on where the rubbing spot is, I will assess the size I need to cut. If it's the heel, I usually just cover the whole heel to ensure no other rubbing spots pop up later on. But, sometimes if it's a skinny strap, then I'll just cut it small and add to it later if need be. After you have determined how big of a piece you will need, then just cut it out to size, leaving the paper backing on. 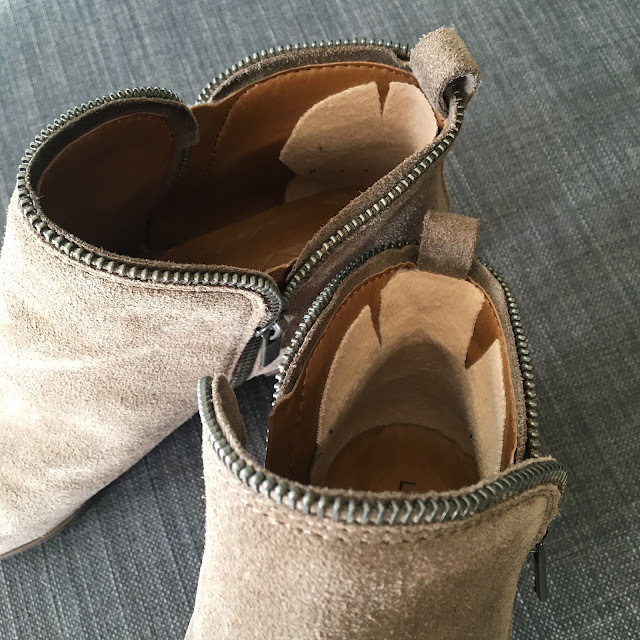 Place the cut piece in the shoe to determine if you need to trim it in any way. On heels, I will often cut slits up one side to help give it a little more curve. Then, you can pull the paper backing off and carefully attach the sticky side to the inside of the shoe. It sticks WELL, so make sure you get it in the right spot. I think in all my years of using moleskin, I've only had to replace it in one pair of shoes from too much wear and tear. So, when I say it sticks, I mean it STICKS like white on rice, baby! It will be there until you decide to remove it. This stuff will change your life. And, for less than $5 you can probably fix all of the shoes in your closet! 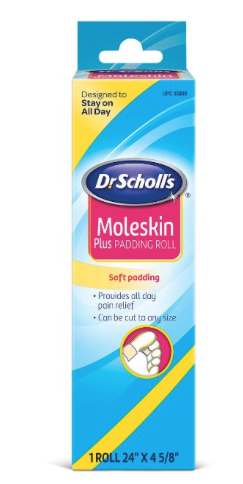 Click here to purchase your life-changing roll of moleskin. ;) Overly-dramatic? No way! You'll be singing it's praises too! Well, that's my tip for the day! Does anyone else have a love affair with moleskin? Do you have any other secrets to help make your shoes more comfortable? **Some of the links in this post are affiliate links, which means I may make a small commission. This does not affect the price you pay but it does help me maintain my blog! So, thank you! Do you have garden veggies coming out of your ears? I usually have such a brown thumb, but this year, something flipped (a pure stroke of good luck) and my garden really flourished! It was so much fun to watch things grow and be able to give away delicious, fresh, organic produce to friends and family. As much fun as it is, it also forced me to get a little creative with how I was going to eat our bounty. 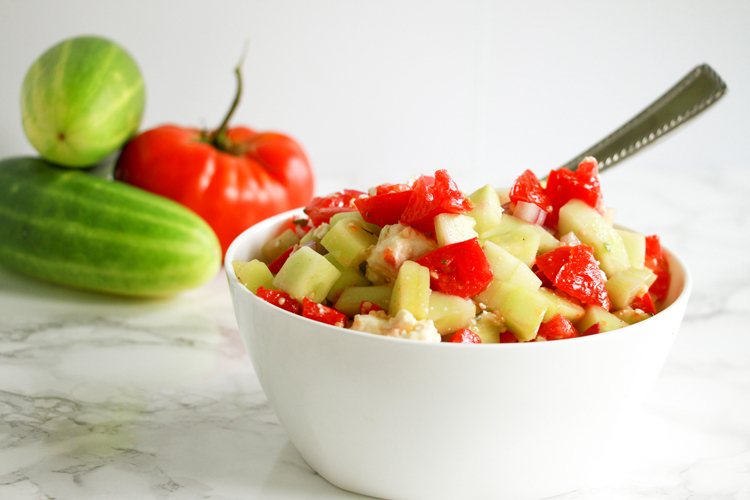 There are only so many cucumber slices and sides of grilled zucchini that a girl can handle. Enter this salad. 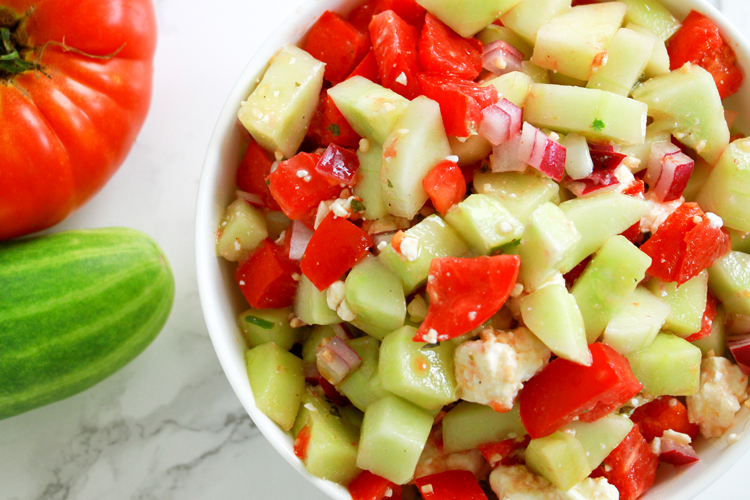 It's a classic, and you have probably made it before or had it at a pot luck, but it's one of those things that is easy to throw together, and usually pleases a crowd. Oh, and it helps use up some of those garden veggies! If you don't have a garden, have no fear. 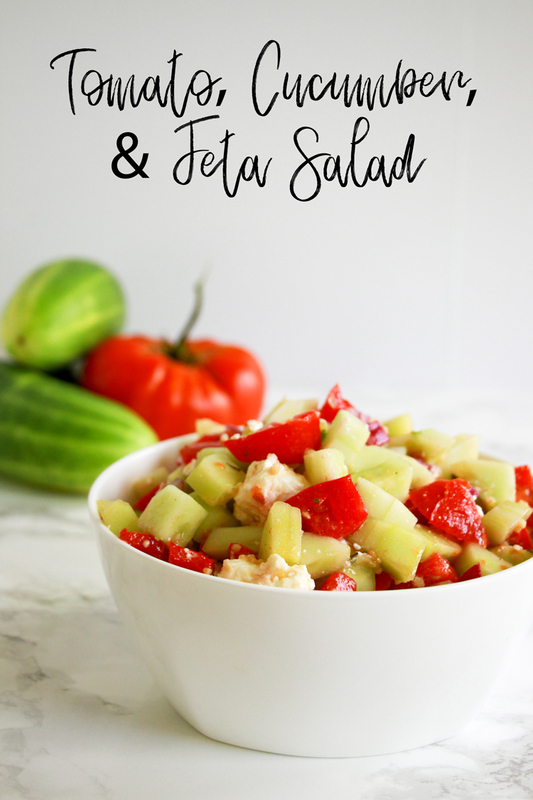 The grocery stores are fully stocked with amazing produce this time of year, and it's all about supply and demand...which means the things you need to make this salad are most likely really darn cheap! Mix dressing ingredients and whisk to combine. Pour over remaining ingredients and toss to coat. Refrigerate until ready to serve! I can't believe it is already September. Don't we end up saying the same thing every year...where does the time go? How can it be September already? Didn't summer just fly by? It seems the older I get, the faster time goes by. A little ironic I suppose. Time just stood still when I was younger, waiting patiently for a much anticipated sleepover or holiday. But now I can literally blink and a month has disappeared. Transitioning into the point of this blog post, as I'm sure you're thinking geez lady, get on with it already!...What is your opinion on wearing white after Labor Day? Growing up in the South, it was a huge faux pax to be seen in white at any time between Sept and March. However, I have noticed over the past few years that those rules have seemed to fade. Maybe it's because I live in the midwest now and they don't seem to have such strict fashion guidelines. Or, maybe it's the norm everywhere nowadays? I've talked about my love for navy and white before, but I wanted to share some more fun pieces in anticipation of being able to wear them past this weekend ;) We also have a little beachy vacay coming up, so I will definitely be able to wear white there without hesitation! This has been such a fun top for the summer. I have dressed it up for a night out with the girls, and also worn it more casually with some shorts. It's lightweight and breezy, and currently marked down to $11.60! I love these pants because they are wide leg and very flowy. I am 5'6" and they are the perfect length on me with flats or a short heel. This is such a fun look without being too fussy! Pants are true to size, and I'm wearing a small in the shirt. I'd say if you have a large chest, the shirt is true to size, otherwise size down. I snagged this cute ruffle sleeve embroidered top recently and it's also currently on clearance! It's marked down to $16.99, and you can get an extra 25% off with code DEALS37 for Labor Day weekend. Grab it now before it's gone! (I'm wearing a small) It's so cute and would transition well into fall. It's a great length for a front tuck or you could leave it out. If you feel funny about wearing white jeans, this top would pair well with regular jeans, or even colored denim...olive and orange are two colors that would be stunning! This skirt is easy to throw on and allows you to feel slightly more pulled together, but still feels like you are wearing loungewear! I love the wrap around detail and the bow in the front. It would also be cute to wear as a swimsuit coverup! I love that it's higher in the front because I don't feel like I am tripping over it while chasing after little ones. If you need a little something extra on your shoulders for those cooler mornings/evenings, this little cropped cocoon sweater is perfect for layering. Mine is old, but here's a similar one. I posted this on social media, but I know that not everyone has social media accounts. 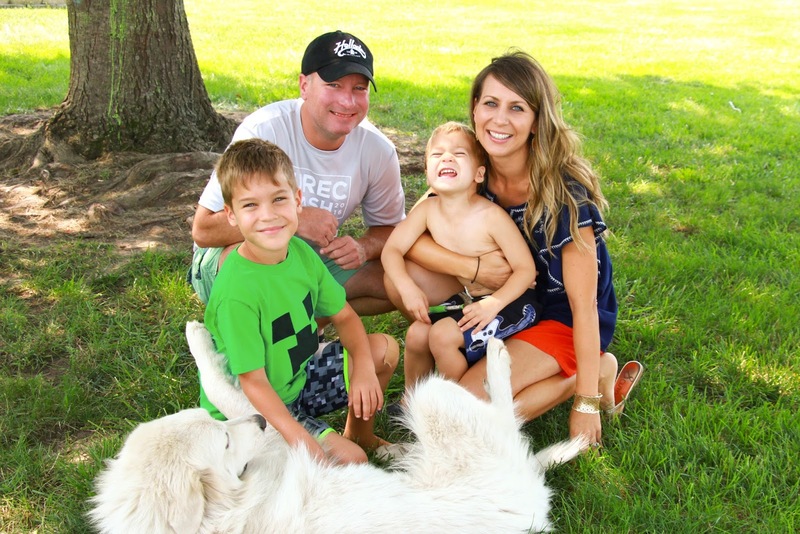 The end of August marks the 1 year anniversary of Midwestern Mama! I just wanted to say a HUGE thanks to everyone out there who reads my blog and supports me! I have loved trying to learn about the blogging world and I have so much I still want to figure out. Thanks for hanging in there with me and holding my hand along the way!